Involved in the theatrical arts and thinking about taking on an apprentice? 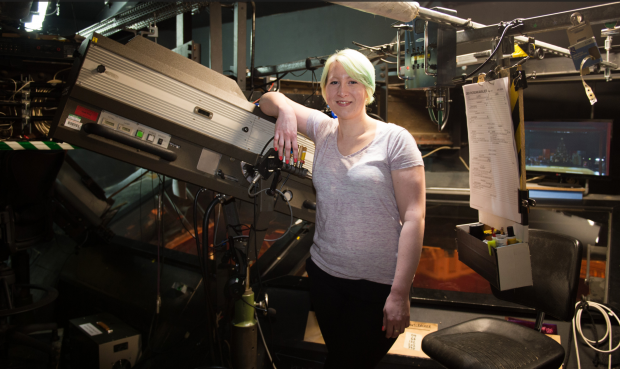 Here, Mel Wells, a lighting apprentice at London’s Royal Opera House, lifts the curtain about exactly what’s involved. Mel, where did you see the apprenticeship advertised? I saw the apprenticeship advertised on The Royal Opera House website. I’d been aware that they did apprenticeships, having looked the previous year, but had not felt ready to apply at that point. I think the fact that there was a lighting specific apprenticeship won me over, I hadn’t seen it advertised the year before. I was torn between applying for the technical apprenticeship and the lighting, but given some thought realised that specialising was a good idea. I’d already studied technical theatre and stage management in college, so knew what I did and didn’t enjoy within the industry. Lighting was my favourite, so I went for it, and haven’t regretted that decision. Describe a ‘typical day’ as an apprentice at the Royal Opera House? The only thing that makes for a typical day at the ROH is starting work in the morning, going on your breaks, and leaving at the end of your day. The work you do within and around those hours varies widely. In lighting systems, typical hours are 9 – 6, Monday – Friday. You could be sat in the office fixing things that have been brought down from the stage, or you could be in the build area fitting lighting into a set that will soon be going on stage. The Linbury, (the ROH’s contemporary theatre) has more of a “normal” theatre feel, one day you’ll be prepping equipment, and the next you’ll be doing a fit up and a tech. Follow spots usually start at 9, you’ll focus some front of house lights ready for a rehearsal or matinée, then you’ll operate the follow spots for the afternoon; if it’s a different show in the evening, you’ll go downstairs and focus again, then operate for the evening. Stage has a similar theme, but with more time on your feet and moving heavy equipment. The set comes in, you’ll focus lamps, do any cues within the show and then the set goes out and you do it all again for the evening show. Follow spots and stage usually have a day in/day off basis, due to the long days, which can be difficult to get used to, but is a lot of fun. How do you find the workplace/college balance? I sometimes find the balance quite tricky. I don’t have to go in to college, so I have do a lot of self-based work and upload it on to a website. Sometimes I find that I get too stuck into work – not that I forget there is college work to do, but I enjoy the physical nature of the work more than sitting down and writing or recording things for college. I enjoy being able to put everything I’ve learned, so far, into my work. I enjoy getting to know those whom I work with. I love being able to see shows from different perspectives, and the satisfaction you feel when everything runs smoothly. I think it’s hard to judge what to expect when you start an apprenticeship at such a prestigious place as the ROH, but in general I don’t think there has been anything that has surprised me in terms of the work I’ve been doing, nor have I been disappointed. I didn’t know, until I started, that I was the first lighting specific apprentice that the ROH had appointed, so I sometimes feel pressure to do well, although, I admit, it’s a personal pressure of not wanting to let myself down. What would you like to do after your apprenticeship is completed? I haven’t given much thought to what placements I’d like to do in my 2nd year, let alone what I might do when I’ve finished. I think there is too much room for change during my time at the ROH, so I’m keeping an open mind. If a full-time job I’m interested in comes up at the ROH then I may apply, but, as it stands, I am keen to leave London and maybe work in a regional theatre, with a small company, or on a UK & Ireland tour. I’m also not against the idea of an international tour. What advice would you give to someone considering applying for an apprenticeship at The Royal Opera House? If it feels rights, then jump. If you already know you want to go down a specific route within backstage theatre, then I recommend doing that. You are going to learn a lot very quickly, and meet people who are willing to pass on everything they know. You will grow as a person and a technician. If you’re not ready, then remember that there’s always next year. Read the first part to this blog series about Alexander Dillon-Mcqueen, a technical theatre apprentice. Click here for a range of Creative Design standards.